Hello Stojo, goodbye disposable cups – mood rooms is taking on the battle against piles of waste with a real novelty. The according to company accounts only patented, foldable and spill-proof to-go cup is a reusable, practical alternative to the disposable version, but also to large drinking solutions that take up lots of room. By simply pressing the cup together, it shrinks in height from the original 12.7 cm down to 4.4 cm in a flash and thus fits inside any bag. 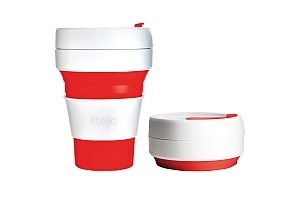 Stojo is made out of food-safe silicon and polypropylene, is phthalate and BPA-free, dishwasher-safe and suitable for the microwave, all of the materials used are recyclable. The mug that won an award in the category is individualised with a sleeve that can be imprinted in up to 2 colours, which furthermore stabilises the cup and protects hands from getting burnt. The product that is imported by Cooper Trade is offered to the promotional products trade via the B2B partner mood rooms in the popular colours green, red, blue, pink, orange and black.